This bulletin features visuals focusing on conflict trends mapped during the second third of 2018. It also highlights a selection of the latest publications on the project’s page, including papers, articles, reports, visuals, and interactive content. The second third of 2018 witnessed a total of 1239 incidents which is a decrease of 13% compared to the first third of the year and a decrease of 31% compared to the same period last year. Baalbeck became the most mapped location with a total of 148 incidents. The caza witnessed an unsteady security situation for the past four months with an overall increase of conflict incidents by 42% compared to the first third of the year. Although the number of arrests (420) decreased by 15% compared to the first third of the year (493), it remained the most mapped category of incident between May and August 2018. No less than 6 armed clashes were mapped in the span of four months, which is consistent with the number recorded during the previous third (7). Most of them were the result of disputes between rival families, or erupted during Army’s operations to arrest wanted criminal groups. 10 hostage taking situations were mapped between May and August 2018 which is consistent with the numbers recorded during the first third of the year. The number of incidents classified Border Conflicts with Syria (69) decreased by 19% compared to the first third of 2018 (85), with incidents mainly related to Syrian nationals arrested for illegal entry. The second third of 2018 witnessed a total of 1239 incidents which is a decrease of 13% compared to the first third of the year. The incidents recorded were scattered across the country since incidents in the 5 most mapped cazas amounted to less than 37% of the total mapped incidents. Between May and August 2018, Baalbeck became the most mapped location with a total of 148 incidents, detroning Sour which only arrived on the third position. Indeed, Baalbeck witnessed an unsteady security situation for the past four months with an overall increase of conflict incidents by 42%. The latter were mainly related to Individual Acts of Violence such as shootings, disputes, robberies, murders, among other crimes. The deteriorating security situation in this caza has been contested by the residents who have been protesting several times demanding authorities to take action and restore security in the area. In fact, Baalbeck is often perceived as “safe haven” for criminals and fugitives who are often protected by political parties or dominant families in the area. In response to the deteriorating security situation, the Lebanese Armed Forces (LAF) have launched at the end of June a security plan in Baalbeck which consisted of heavy military deployment, raids operations, and arrests of wanted criminals. The number of incidents mapped in Beirut (127) considerably increased by 70% compared to the first third of 2018 (75) making the capital the second most mapped location. It was followed by Sour with a total of 106 incidents. The increase of incidents in Beirut could be attributed to the rise of state interventions with recurrent raids and arrests operations occurring in this district in response to criminal acts such as robbery, illicit trade, and shooting. Indeed, Beirut is the Lebanese capital and represents the centre of the economic, political, and cultural activities in Lebanon as well as its largest city with an estimated number of 1.5 million inhabitants, which explains the eminent state’s presence and intervention in the caza. Although the number of arrests (420) decreased by 15% compared to the first third of the year (493), it remained the most mapped category of incident between May and August 2018. Similarly, while the airspace violations by the Israeli Military witnessed a significant drop by 39% compared to the last third, it was still ranked as the second most mapped category. However, it is noteworthy to point that this decrease does not necessarily imply a de-escalation of tensions between Lebanon and Israel. Indeed, the latter have often been launching threats against Lebanon and Hezbollah over the past months, while Hezbollah has been warning Israel about the gowing forces and military capacity of its party. Moreover, the Israel Army has resumed the construction of a controversial wall at the borders, which has contributed to rising tensions between the countries. In this tense context, on August 30th, the Security State Council renewed the UNIFIL mandate by one additional year while warning the international community about the risks of resurgence of a new violent conflict in case the ceasefire agreed between Lebanon and Israel was violated. UNIFIL forces have been deployed on the Lebanese-Israeli borders since 1978, and reinforced after the 2006 Israeli war on Lebanon. They have been mandated to mainly monitor cessation of hostilities, restore peace and security, as well as ensure the return of state effective authority in this area. The number of shootings (117) increased by 17% compared to the first third of 2018 (100), with incidents mainly related to brawls and disputes that escalated violently but also resulting of celebratory shootings. Although celebratory shootings are common in Lebanon, the second third of the year witnessed a particular surge of such incidents. Indeed, this period witnessed many events and occasions which added a pretext for celebratory shootings such as the result of Parliamentary elections held on May 6th, the result of the official exams at the end of June, as well as the beginning of the weddings season, among others. Despite the ISF campaign launched in June to raise awareness about the issue, gunfire were still used as a mean of celebration during the aforementioned occasions. (To learn more about shooting incidents, read the Conflict Analysis bulletin, Issue 10 here). No less than 6 armed clashes were mapped in the span of four months, which is consistent with the number recorded during the previous third (7). Most of them were the result of disputes between rival families, or erupted during Army’s operations to arrest wanted criminal groups. For instance, on May 22nd, a wanted criminal opened fire and thrown grenades towards an LAF patrol during an arrest operation. Most of the time, heavy artillery, grenades, machine guns, and other heavy weapons are used during these clashes, often leading to casualties, injuries, as well as material damages. Moreover, these clashes usually involve wanted criminals or member of prominent clans backed by their own militia. As a result, the eruption of armed clashes frequently occurred in Lebanon especially in Bekaa and Baalbeck, revealing the fragility of state control to maintain order in these areas. Although the number of gender-based violence incidents reported significantly decreased compared to the last third (27),13 cases were mapped between May and August 2018 mostly related to murders and femicides, indicating that approximately 3 women are victims of violence per month in Lebanon. Although VAW incidents are usually under-reported, these figures are still alarming (For more on gender-based violence read the Conflict Analysis bulletin, Issue 11 here). 10 hostage taking situations were mapped between May and August 2018. For instance, on August 18th, the Army dismantled a smuggling ring in Zahle which allegedly smuggled Syrian nationals into the country and detained them until a ransom was paid for their release. Moreover, the ring confiscated the legal documents of their victims and demanded money in order to return them. Over 300 identity papers belonging to Syrian nationals were seized during this operation. Extortion and kidnapping of Syrian civilians and refugees in Lebanon has been on the rise since the eruption of the Syrian conflict in 2012, especially on the Lebanese - Syrian border areas. Most of these involved organised criminal groups who are taking advantage of the precarious security and socio-economic situation in Syria as well as the vulnerability of the Syrian civilians and refugees in order to commit their crimes. 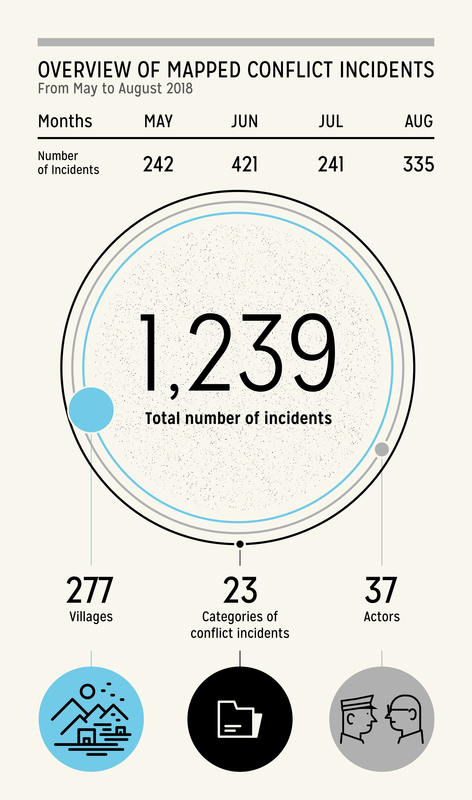 Although the number of incidents involving the Israeli Military (354) decreased by 39% compared to the last third (579), it remained the most mapped actor. It is followed by the Lebanese civilians (349) and the Internal Security Forces (243). More than half of the incidents involving Lebanese civilians were related to Individual Acts of Violence (200). Similar to the previous third, ISF appears to have been actively tackling smuggling operations since the majority of ISF interventions were relevant to illicit trade (125 incidents). Syrian civilians were involved in 150 incidents which is a slight decrease compared to the previous third (190), with most of them relevant to the arrest of Syrian nationals for illegal stay, or for committing infractions such as forgery, illicit trade, robbery, etc. Similarly, the number of incidents involving Palestinian civilians (71) slightly decreased compared to the first third of the year (81). Also, the majority of the incidents were located in the refugees’ camp of Ain el-Helweh. Between May and August 2018, Individual Acts of Violence became the most mapped primary classification of conflict, surpassing the Israeli Border Conflicts. Indeed, the number of Individual Acts of Violence (545) increased by 17% compared to the last third (466), and represented alone 44% of the total mapped incidents. The majority of them (303) were related to state security apparatuses conducting military deployments, raids, and arrests operations against wanted suspects. Although most of these operations came as a response to criminality and law infringements, many of them were also pre-emptive measures to prevent security incidents from occurring and to maintain order. For instance, on May 6th, the Army heavily deployed across Lebanon as part of a security plan during the Parliamentary elections. (For more on state apparatuses actions check the Map of State Response here). The number of incidents classified Border Conflicts with Syria (69) decreased by 19% compared to the first third of 2018 (85), with incidents mainly related to Syrian nationals arrested for illegal entry. Such arrests have been frequent over the past years, especially in the areas nearby the Lebanese- Syrian borders such as Marjaayoun and Hasbaya. Moreover, four of these incidents were also classified as Conflicts of Social Discrimination, mainly involving Army’s operations against Syrian refugees camp..
Also tensions have been increasing between host communities and Syrian refugees during the second third of 2018. On June 13th, a protest was organised in front of the UNRWA by Free Patriotic Movement supporters for Syrian refugees to return to their country. Also, on July 8th, following a dispute between Syrians refugees and Lebanese citizens, 47 of refugees tents were burned in Mhamra camp in Tripoli. These incidents came in a context of rising tensions between the Lebanese Government and the international community regarding the presence of Syrian refugees in Lebanon. Indeed, over the past months, thousands of Syrian departed from Lebanon to Syria as what was reported as a “voluntary return”. However, the voluntary aspect of these returns have been contested by some elements within the international community as well as by the Lebanese civil society. A statement released by the UNHCR denied any involvement in these returns, and rather emphasised the need to investigate refugees’ intentions, and the conditions under which these returns took place. Likewise, several local civil society organisations released a joint statement firmly condemning Lebanese authorities hostile position against Syrian refugees and calling the government for policies aligned with human rights principles. .Moreover,, various civil society actors in the mediterranean, which included Lebanese NGOs and activists, launched an online Manifesto for Solidarity, Humanity and Dignity with persons in exile, reiterating these principles over restrictive and inhumane migration policies. Between May and August 2018, 199 incidents were classified as Power and Governance which is a slight decrease of 9% compared to the previous third. Most of these were related to illicit trade and trafficking of drugs, document forgery, and counterfeit money. Moreover, this period witnessed a rise of political tensions notably during the Parliamentary elections period, which sometimes resulted in disputes and confrontations between supporters of rival political parties. For instance, on May 8th, one person was killed in Aley during a dispute between supporters of the Progressive Socialist Party (PSP) and the Lebanese Democratic Party. Such incidents were seen by many as a threat to the Lebanese already fragile stability as they revived political and sectarian tensions, steering away the country from the “negative peace” it has been witnessing lately. No less than 14 Conflicts of Social Discrimination were mapped in during the reporting period. 5 of them were categorised as collective actions in support of causes such as women’s rights, and domestic workers’ rights. For instance, on June 24, civil society’s actors organised a protest asking for Lebanese women right to pass their nationality onto their children. Over the past decades, civil society actors have been actively protesting in order to amend the law without any success so far. Authorities have argued that granting this right to women could disrupt the demographic balance in the country, without explaining how men could have this right without unsettling the country as well. In reality, despite some incremental steps in recent years to protect women rights, Lebanon sill does not guarantee equal rights for men and women. Indeed, personal status laws which organise the personal status such as marriage, custody, and inheritance among others often tends to discriminate women. Over the past two decades, cyberactivism has transformed the way political protests and social movements are organised. Digital activism is often seen as a new form of political participation which allows large groups of people to easily interact and mobilise for political actions. Yet, some scholars have warned against the illusion of the Internet as a public space as the fast growing support to online mobilisations is often followed by even faster disengagement. In Lebanon, social media are often used by civil society actors such as NGOs, activists, journalists, but also individuals as a mean to spread news, denounce or raise awareness about issues, as well as express political opinions. Many NGOs have been using online campaigns as a mode of action to mobilise supporters over their cause. 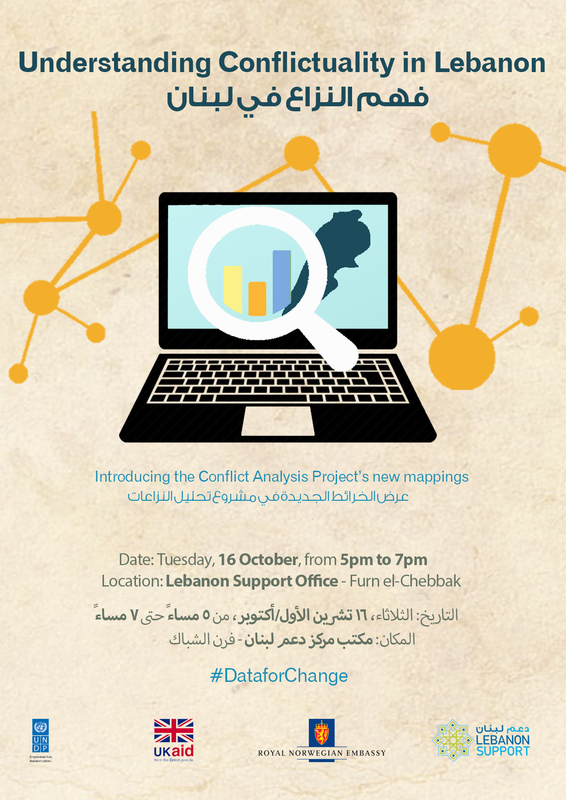 (Check the Map of Collective Actions in Lebanon to learn more about online campaign here). While the internet is considered as a powerful tool to spread information in a short time, many experts have warned about its limitations as an effective activism tool, as well as dangers such as cyber bullying, online harassments, theft of personal information, among others cybercrimes. In 2006, ISF created the Cyber Crime and Intellectual Property Rights Bureau in order to combat cyber crimes and enhance online security in Lebanon. However, this bureau has generated many controversies since its establishment notably regarding the arbitrary enforcement of an outdated law from 1943 Penal Code, which criminalises defamation against public officials, the president, the Lebanese flag, or the national emblem. While freedom of speech and freedom of press are guaranteed by the Lebanese constitutions “within the limits established by the law”, the penal code is often used as an attempt to silence critics by incriminating individuals over mere jokes, sarcastic comments, or any criticisms towards government officials and religious figures. Although this practice has been common for the past years, the detention of individuals for expressing personal opinion on social media seem to have been more recurrent over the last months. Indeed, no less than 9 of such incidents have been mapped in the span of four months only between May and August 2018. For instance, on July 20th, young activist Charbel Khoury was detained by the cybercrimes bureau for writing a post in an allegedly sarcastic tone about the miracles of Saint Charbel. Following the post, Charbel Khoury and Joy Slim – who interacted with Khoury’s post – have been massively insulted, bullied, harassed, and threatened online. This particular incident considerably questions the role and willingness of the bureau to effectively protect citizens against cybercrimes. In fact, instead of pursuing the harrassors, the Cyber Crime Bureau detained and interrogated Slim and Khoury for hours, indicating that the bureau acts more as a repressive institution impeding online speech rather than a security body fighting against online crimes. Moreover, Khoury was only released after signing a pledge not to address religion in his posts and delete his facebook account for a month. Without having any legal basis, such pledges are frequently used by authorities as an intimidation tactic in order to refrain individuals from certain acts. Indeed, many detained individuals have reported of being threatened, assaulted, or forbidden to contact anyone including a lawyer during their interrogation. As a result, detained activists may bend to authorities pressure and end up signing pledges in exchange for their release, although these practices constitute a violation of Art. 47 of the Lebanese Code for Criminal Procedure which lists the rights of detained persons, notably the right to remain silent, and contact a family member or a lawyer. Overall, these practices and detentions constitute a threat to freedom of expression and reflect an increasingly shrinking space for free speech in Lebanon. As such, civil society has been actively mobilising against the infringement to the right of freedom of speech. An online campaign “Against repression” has been launched by several activists and NGOs in order to denounce this “unprecedented decline in freedom of expression in all forms.” Moreover, a “call for action to condemn the Lebanese authorities’ pervasive summons of peaceful activists infringing their right to freedom of expression”, was co-signed by several civil society organisations, in order to raise concerns regarding violations of the right to freedom of expression in Lebanon. Demonstrations were also organised notably on July 24th and August 31st, to protest against such arbitrary arrests. These recent events contributed to steer the debate about the space and limits of freedom of speech and reiterated the need to have an adapted law clearly defining both aspects, as to not be used as a mean to repress free expression while guaranteeing online security at the same time. For the full description of the event, click here. وتتضمّن هذه النشرة رسومات بيانية تُركِّز على اتجاهات النزاعات الممسوحة خلال ثاني أربع أشهر من السنة من ٢٠١٨. كما أنها تسلط الضوء على مروحة منتقاة من أحدث المطبوعات والمنشورات على صفحة مشروع تحليل النزاعات، بما في ذلك الأوراق، والمقالات، والتقارير، والرسومات البيانية، والمحتوى التفاعلي. شهد الثلث الثاني من العام ٢٠١٨ ما مجموعه ١٢٣٩ حادثاً، ما يمثّل انخفاضاً بنسبة ١٣ بالمئة بالمقارنة مع الثلث الأوّل من العام وانخفاضاً بنسبة ٣١ بالمئة بالمقارنة مع الفترة عينها في العام المنصرم. أصبحت بعلبك أكثر المناطق مسحاً بما مجموعه ١٤٨ حادثاً. شهد القضاء في الأشهر الأربع الأخيرة وضعاً أمنياً غير مستقرٍ بارتفاعٍ إجمالي في حوادث النزاعات بنسبة ٢٢ بالمئة بالمقارنة مع الثلث الأوّل من العام. على الرغم من أنّ عدد التوقيفات (٤٢٠) انخفض بنسبة ١٥ بالمئة بالمقارنة مع الثلث الأوّل من العام (٤٩٣)، فقد بقي أكثر فئات الحوادث مسحاً بين شهري أيار/ مايو وآب/ أغسطس ٢٠١٨. تمّ مسح ما لا يقلّ عن ٦ اشتباكات مسلّحة على مدى أربعة أشهر، ما يتوافق مع العدد المسجّل أثناء الثلث السابق (٧). نتج معظم هذه الاشتباكات عن خلافاتٍ بين عائلات متنافسة، أو اندلعت أثناء عمليات الجيش الهادفة لتوقيف المجموعات الإجرامية المطلوبة. تمّ مسح ١٠ حالات احتجاز رهائن بين شهري أيار/ مايو وآب/ أغسطس ٢٠١٨، ما يتوافق مع الأعداد المسجّلة في الثلث الأوّل من العام. انخفض عدد الحوادث المصنّفة في فئة نزاعات حدودية مع سوريا (٦٩) بنسبة ١٩ بالمئة بالمقارنة مع الثلث الأوّل من العام ٢٠١٨ (٨٥)، بحوادث تعلّقت بصورةٍ رئيسيةٍ بتوقيف مواطنين سوريين بتهمة الدخول غير الشرعي. شهد الثلث الثاني من العام ٢٠١٨ ما مجموعه ١٢٣٩ حادثاً، وهذا يمثّل انخفاضاً نسبته ١٣ بالمئة بالمقارنة مع الثلث الأوّل من العام. وقد توزّعت الحوادث المسجّلة عبر البلاد بما أنّ الحوادث في الأقضية الخمسة الأكثر مسحاً بلغت أقلّ من ٣٧ بالمئة من مجموع الحوادث الممسوحة. بين أيار/ مايو وآب/ أغسطس ٢٠١٨، باتت بعلبك أكثر المواقع مسحاً بما مجموعه ١٤٨ حادثاً، مزيحةً صور التي احتلت المرتبة الثالثة فقط. وبالفعل، شهدت بعلبك وضعاً أمنياً غير مستقرٍ في الأشهر الأربعة المنصرمة، بزيادةٍ إجماليةٍ لحوادث النزاع بنسبة ٤٢ بالمئة. كان معظم هذه الحوادث ضمن فئة أعمال العنف الفردية مثل إطلاق النار والخلافات والسرقة والقتل وغيرها من الجرائم. وقد احتجّ أهالي هذا القضاء على تدهور الوضع الأمني مرّاتٍ عديدة، فطالبوا السلطات بالتحرّك وإعادة الأمن إلى المنطقة. في الواقع، كثيراً ما يُنظر إلى بعلبك بوصفها "ملاذاً آمناً" للمجرمين والفارّين من العدالة الذين كثيراً ما تحميهم الأحزاب السياسية أو العائلات المسيطرة في المنطقة. رداً على تدهور الوضع الأمني، أطلق الجيش اللبناني في أواخر حزيران/ يونيو خطّةً أمنيةً في بعلبك تمثّلت في انتشارٍ عسكريٍ كثيف ومداهماتٍ وتوقيفٍ للمجرمين المطلوبين. بلغ عدد الحوادث الممسوحة في بيروت ١٢٧ حادثاً، بزيادةٍ معتبرةٍ قدرها ٧٠ بالمئة بالمقارنة مع الفصل الأوّل من العام ٢٠١٨ (٧٥ حادثاً)، ما يجعل العاصمة تحتلّ المرتبة الثانية في ترتيب المواقع الأكثر مسحاً. وتليها في هذا الترتيب صور التي بلغ إجمالي عدد الحوادث فيها ١٠٦. يمكن أن تُنسب زيادة الحوادث في بيروت إلى ارتفاع التدخّلات الحكومية، مع تكرار عمليات المداهمات والتوقيفات في هذا القطاع ردّاً على الأفعال الإجرامية من قبيل السرقة والإتجار غير المشروع وإطلاق النار. وبالفعل، بيروت هي عاصمة لبنان وتمثّل مركز النشاطات الاقتصادية والسياسية والثقافية في البلد، كما أنّها أكبر مدينةٍ، إذ يقدّر عدد سكّانها بمليون ونصف مليون نسمة، ما يفسّر وجود وتدخّل الدولة البارزين في هذا القضاء. وعلى الرغم من أنّ عدد التوقيفات (٤٢٠) انخفض بنسبة ١٥ بالمئة بالمقارنة مع الثلث الأوّل من السنة (٤٩٣)، فقد بقيت هذه الفئة أكثر الفئات مسحاً بالنسبة إلى الحوادث بين شهري أيّار/ مايو وأغسطس/ آب ٢٠١٨. على نحوٍ مشابه، وفي حين أنّ انتهاكات المجال الجوّي التي ارتكبها الجيش الإسرائيلي قد شهدت انخفاضاً ملموساً بنسبة ٣٩ بالمئة بالمقارنة مع الثلث السابق، فهي لا تزال تحتلّ المرتبة الثانية في أكثر الفئات مسحاً. لكن تجدر الإشارة إلى أنّ هذا الانخفاض لا يعني بالضرورة انخفاضاً في التوتر بين لبنان وإسرائيل. فقد أطلقت إسرائيل تهديداتٍ كثيرةً ضدّ لبنان وحزب الله في الأشهر المنصرمة، في حين أنّ حزب الله حذّر إسرائيل من تنامي قوّاته وقدرته العسكرية. علاوةً على ذلك، استأنف الجيش الإسرائيلي بناء الجدار المثير للجدل على الحدود، ما ساهم في تصاعد التوتّرات بين البلدين. في هذا السياق المتوتّر وبتاريخ الثلاثين من آب/ أغسطس، جدّد مجلس الأمن القومي تفويض اليونيفيل لسنةٍ إضافية، محذّراً في الوقت عينه المجتمع الدولي من مخاطر حدوث نزاعٍ عنيفٍ جديد في حال انتُهك وقف إطلاق النار الذي توافق عليه لبنان وإسرائيل. تنتشر قوّات اليونيفيل على الحدود اللبنانية الإسرائيلية منذ العام ١٩٧٨، وتعزّزت بعد حرب إسرائيل على لبنان في العام ٢٠٠٦. وقد انتُدبت تلك القوّات بصورةٍ رئيسةٍ لمراقبة وقف الأعمال العدائية وإعادة السلام والأمن، وكذلك لضمان عودة سلطةٍ حكوميةٍ فعّالةٍ في تلك المنطقة. ارتفع عدد حالات إطلاق النار (١١٧ حالة) بنسبة ١٧ بالمئة بالمقارنة مع الثلث الأوّل من العام ٢٠١٨ (١٠٠ حالة)، وارتبطت هذه الحوادث بصورةٍ أساسيةٍ بشجاراتٍ وخلافاتٍ تصاعدت بعنف، لكنّها نتجت أيضاً عن حوادث إطلاق نارٍ احتفالية. وعلى الرغم من أنّ إطلاق النار احتفالاً شائعٌ في لبنان، فقد شهد الثلث الثاني من العام ارتفاعاً خاصاً في مثل هذه الحوادث. وبالفعل، فقد شهدت هذه الفترة كثيراً من الأحداث والمناسبات التي أضافت حجّةً لإطلاق النار الاحتفالي كما حدث بسبب الانتخابات البرلمانية التي أجريت في السادس من أيار/ مايو، وبسبب الامتحانات الرسمية في أواخر حزيران/ يونيو، وكذلك في بداية موسم الأعراس، وغيرها من المناسبات. وعلى الرغم من الحملة التي أطلقتها قوى الأمن الداخلي في حزيران/ يونيو لزيادة الوعي بهذه المسألة، فإنّ إطلاق النار بقي مستخدماً كوسيلةٍ للاحتفال أثناء المناسبات المذكورة أعلاه. (لمعرفة المزيد عن حوادث إطلاق النار، اقرأ نشرة تحليل النزاعات، العدد ١٠ هنا). تمّ مسح ما لا يقلّ عن ٦ اشتباكات مسلّحة على مدى أربعة شهور، ما يتوافق مع العدد المسجّل في الثلث السابق (٧ اشتباكات). وقد نجم معظمها عن خلافاتٍ بين عائلاتٍ متنافسة، أو اندلع أثناء العمليات التي قام بها الجيش لتوقيف مجموعات إجرامية مطلوبة. على سبيل المثال وفي ٢٢ أيار/ مايو، أطلق مجرمٌ مطلوبٌ النار ورمي قنابل يدوية على دوريةٍ تابعةٍ للجيش اللبناني أثناء عملية توقيف. في معظم الأحيان، تستخدم المدفعية الثقيلة والقنابل اليدوية والرشاشات وغيرها من الأسلحة الثقيلة في هذه الاشتباكات، مؤدّيةً في أحيانٍ كثيرةٍ إلى وقوع قتلى ومصابين، وكذلك إلى أضرارٍ مادّية. علاوةً على ذلك، ينخرط في هذه الاشتباكات مجرمون مطلوبون أو أعضاء في عشائر بارزة تدعمها ميليشياتها الخاصّة. نتيجةً لذلك، اندلعت الاشتباكات المسلّحة على نحوٍ متكرّرٍ في لبنان في منطقتي البقاع وبعلبك بخاصّة، ما يكشف هشاشة تحكّم الدولة بالحفاظ على النظام في هاتين المنطقتين. على الرغم من أنّ عدد حوادث العنف على أساس النوع الاجتماعي المذكورة قد انخفض انخفاضاً ملموساً بالمقارنة مع الثلث السابق (٢٧ حادثاً)، فقد مُسحت ١٣ حالة بين شهري أيار/ مايو وآب/ أغسطس ٢٠١٨ وارتبط معظمها بالقتل وقتل الإناث، ما يشير إلى أنّ ٣ نساء تقريباً يعانين من العنف شهرياً في لبنان. وعلى الرغم من أنّ عدد حوادث العنف ضد النساء المبلّغ عنها يقلّ عادةً عن عددها الحقيقي، فإنّ هذه الأرقام لا تزال تنذر بالخطر (لمزيدٍ من المعلومات عن العنف على أساس النوع الاجتماعي، اقرأ نشرة تحليل النزاعات، العدد ١١ هنا). تم مسح ١٠ حالات احتجاز رهائن بين شهري أيار/ مايو وآب/ أغسطس ٢٠١٨. على سبيل المثال، فكّك الجيش بتاريخ ١٨ آب/ أغسطس شبكةً للتهريب في زحلة، هرّبت على نحوٍ غير مشروعٍ مواطنين سوريين إلى لبنان واحتجزتهم حتّى دفع فديةٍ لإطلاق سراحهم. علاوةً على ذلك، صادرت الشبكة أوراق الضحايا الثبوتية وطلبت الأموال لقاء إعادتها إليهم. وقد صودر أثناء هذه العملية أكثر من ٣٠٠ ورقة ثبوتية تعود ملكيتها لمواطنين السوريين. وقد ارتفعت حالات ابتزاز وخطف المدنيين واللاجئين السوريين في لبنان منذ اندلاع النزاع السوري في العام ٢٠١٢، ولاسيما في المناطق الحدودية بين لبنان وسوريا. تورّط في معظم هذه الحوادث مجموعاتٌ إجراميةٌ منظّمة تستفيد من تزعزع الأمن والوضع الاجتماعي الاقتصادي في سوريا، ومن هشاشة وضع المدنيين واللاجئين السوريين في ارتكاب جرائمهم. وعلى الرغم من أنّ عدد الحوادث التي تتعلّق بالجيش الإسرائيلي (٣٥٤ حادثاً) انخفض بنسبة ٣٩ بالمئة بالمقارنة مع الثلث السابق (٥٧٩ حادثاً)، فهو يبقى الفاعل الأكثر مسحاً. يليه في الترتيب المدنيون اللبنانيون (٣٤٩ حادثاً) وقوى الأمن الداخلي (٢٤٣ حادثاً). ارتبط أكثر من نصف الحوادث المتعلّقة بمدنيين لبنانيين بأعمال عنف فردية (٢٠٠ حادث). وعلى غرار الثلث السابق من العام، يبدو أنّ قوى الأمن الداخلي تصدّت لعمليات تهريبٍ بما أنّ معظم تدخّلاتها تعلّقت بالإتجار غير المشروع (١٢٥ حادثاً). بين شهري أيار/ مايو وآب/ أغسطس ٢٠١٨، احتلّت أعمال العنف الفردية المرتبة الأولى في نزاعات التصنيف الأوّلي الأكثر مسحاً، متجاوزةً في ذلك النزاعات الحدودية مع إسرائيل. وبالفعل، ارتفع عدد أعمال العنف الفردية (٥٤٥ حادثة) بنسبة ١٧ بالمئة بالمقارنة مع الثلث السابق (٤٦٦ حادثة) ومثّلت وحدها ٤٤ بالمئة من مجموع الحوادث الممسوحة. ارتبط معظمها (٣٠٣ حوادث) بأجهزة أمن الدولة التي تقوم بعمليات انتشار عسكري ومداهمات وتوقيفاتٍ لمشتبهين مطلوبين. وعلى الرغم من أنّ هذه العمليات شكّلت ردّاً على الإجرام وانتهاكات القانون، فإنّ كثيراً منها كان أيضاً إجراءاتٍ استباقية لمنع وقوع الحوادث الأمنية والحفاظ على النظام. على سبيل المثال وبتاريخ ٦ أيار/ مايو، انتشر الجيش بكثافة في أرجاء لبنان ضمن خطّةٍ أمنيةٍ أثناء الانتخابات اللبنانية. (لمزيدٍ من المعلومات عن أفعال أجهزة الدولة، راجع خريطة استجابة الدولة هنا). انخفض عدد الحوادث المصنّفة ضمن فئة النزاعات الحدودية مع سوريا (٦٩ حادثاً) بنسبة ١٩ بالمئة بالمقارنة مع الثلث الأوّل من العام ٢٠١٨ (٨٥ حادثاً)، وارتبطت هذه الحوادث بصورةٍ رئيسيةٍ بتوقيف مواطنين سوريين بسبب الدخول غير المشروع إلى البلاد. كانت مثل هذه التوقيفات شائعةً في السنوات الماضية، ولاسيما في المناطق القريبة من الحدود اللبنانية السورية مثل مرجعيون وحاصبيا. علاوةً على ذلك، صُنّف أربعةٌ من هذه الحوادث ضمن فئة النزاعات المرتبطة بالتمييز الاجتماعي، وضمّت بصورةٍ رئيسيةٍ عملياتٍ قام بها الجيش ضدّ مخيّمٍ للاجئين السوريين. كذلك، ازدادت التوتّرات بين المجتمعات المضيفة واللاجئين السوريين في الثلث الثاني من العام ٢٠١٨. فبتاريخ ١٣ حزيران/ يونيو، نظّم مناصرو التيّار الوطني الحرّ احتجاجاً أمام الأونروا من أجل إرجاع اللاجئين السوريين إلى بلادهم. كذلك وبتاريخ ٨ تموز/ يوليو، وعلى أثر خلافٍ بين لاجئين سوريين ومواطنين لبنانيين، تمّ حرق ٤٧ خيمة في مخيّم محمرة للاجئين في طرابلس. أتت هذه الحوادث في سياق ازدياد التوتّرات بين الحكومة اللبنانية والمجتمع الدولي بخصوص وجود اللاجئين السوريين في لبنان. فعلى مدى الأشهر المنصرمة، رحل آلاف السوريين من لبنان إلى سوريا كجزءٍ ممّا نُقل بأنّه "عودة طوعية". غير أنّ بعض العناصر ضمن المجتمع الدولي وكذلك المجتمع المدني اللبناني شكّكوا في المظهر الطوعي لعمليات العودة هذه. وقد أنكر بيانٌ أصدرته المفوضية العليا للاجئين التابعة للأمم المتحدة أيّ علاقةٍ بينها وبين عمليات العودة هذه، وشدّدت على الحاجة للتحقيق في نوايا اللاجئين وفي الشروط التي حدثت فيها تلك العمليات. كذلك، أصدرت عدّة منظّمات مجتمع مدني محلّية بياناً مشتركاً يشجب بشدّةٍ موقف السلطات اللبنانية المعادي للاجئين السوريين ويدعو الحكومة إلى انتهاج سياساتٍ تتماشى مع مبادئ حقوق الإنسان. فضلاً عن ذلك، أطلق عددٌ من فاعلي المجتمع المدني في حوض البحر المتوسّط، بمن فيهم منظّمات لبنانية غير حكومية وناشطون لبنانيون، على الشبكة العنكبوتية بياناً للتضامن والإنسانية والكرامة مع الأشخاص المنفيين، مؤكّدةً على هذه المبادئ إزاء السياسات التقييدية وغير الإنسانية المتعلّقة بالهجرة. بين شهري أيار/ مايو وآب/ أغسطس ٢٠١٨، تمّ تصنيف ١٩٩ حادثاً في فئة النزاعات على السلطة والحكم بانخفاضٍ طفيفٍ قدره ٩ بالمئة بالمقارنة مع الثلث السابق. ارتبط معظم هذه الحوادث بالإتجار غير المشروع تهريب المخدّرات، وتزوير الوثائق، وتزييف العملة. علاوةً على ذلك، شهدت هذه الفترة زيادةً في التوتّرات السياسية، ولاسيّما في فترة الانتخابات البرلمانية، ما أدّى في بعض الأحيان إلى خلافاتٍ ومواجهاتٍ بين مناصري الأحزاب السياسية المتنافسة. على سبيل المثال وبتاريخ ٨ أيّار/ مايو، قُتل شخصٌ في عاليه أثناء خلافٍ بني مناصري الحزب التقدّمي الاشتراكي والحزب الديمقراطي اللبناني. وقد رأى كثيرون في مثل هذه الحوادث تهديداً للاستقرار اللبناني الهشّ أصلاً لأنّها أحيت التوتّرات السياسية والمذهبية، مبعدةً البلاد عن "السلم السلبي" الذي شهدته مؤخّراً. تمّ مسح ما لا يقلّ عن ١٤ نزاعاً مرتبطاً بالتمييز الاجتماعي في الفترة المشمولة بالتقرير. وقد صُنّف خمسةٌ من تلك النزاعات بوصفها تحرّكاتٍ دعماً لقضايا من قبيل حقوق المرأة وحقوق عاملات الخدمة المنزلية. فعلى سبيل المثال وبتاريخ ٢٤ حزيران/ يونيو، نظّم فاعلو المجتمع المدني احتجاجاً للمطالبة بحقّ المرأة اللبنانية في منح جنسيّتها لأبنائها. على مدى العقود المنصرمة، احتجّ فاعلو المجتمع المدني بنشاطٍ بهدف تعديل القانون من دون نجاحٍ حتّى الآن. وقد جادلت السلطات في أنّ منح هذا الحقّ للمرأة يمكن أن يخلّ بالتوازن الديموغرافي في البلاد، من دون أن تشرح كيف يمكن أن يحوز الرجل على هذا الحقّ من دون إضرارٍ باستقرار البلد. في الواقع، وعلى الرغم من بعض الخطوات المتزايدة في السنوات الأخيرة لحماية حقوق المرأة، فلا يزال لبنان لا يمنح حقوقاً متساوية للرجل والمرأة. وبالفعل، تميل قوانين الأحوال الشخصية التي تنظّم الشؤون الشخصية كالزواج والوصاية والميراث وغيرها إلى التمييز ضد المرأة. على مدى العقدين المنصرمين، حوّل النشاط على الإنترنت طريقة تنظيم الاحتجاجات السياسية والحركات الاجتماعية. كثيراً ما يُنظر إلى النشاط الرقمي بوصفه شكلاً جديداً للمشاركة السياسية، يتيح لمجموعاتٍ كبيرة من الناس التفاعل بسهولةٍ والتحرّك من أجل القيام بنشاطاتٍ سياسية. غير أنّ بعض الأكاديميين قد حذّروا من وهم الإنترنت بوصفه مساحةً عامّةً بما أنّه في كثيرٍ من الأحيان، يتبع الدعمَ المتزايد لضروب التحشيد على الإنترنت انسحابٌ أكثر سرعةً. في لبنان، كثيراً ما يستخدم الفاعلون في المجتمع المدني، كالمنظّمات غير الحكومية والناشطين والصحافيين، وكذلك الأفراد، وسائل التواصل الاجتماعي وسيلةً لنشر الأخبار والشجب أو زيادة الوعي حول بعض القضايا، وكذلك للتعبير عن الآراء السياسية. قام كثيرٌ من المنظّمات غير الحكومية باستخدام الحملات الإلكترونية كأسلوبٍ للنشاط من أجل تحشيد المناصرين لقضيتهم. (راجع خريطة التحرّكات في لبنان لمعرفة المزيد عن الحملة الإلكترونية هنا). وفي حين أنّ الإنترنت يُعدّ أداةً قويّةً لنشر المعلومات في وقتٍ قصير، فقد حذّر خبراءٌ عديدون من حدوده بوصفه أداةً للنشاط، وكذلك من مخاطره التي تتضمّن الإساءة الإلكترونية والتحرّش على الإنترنت وسرقة المعلومات الشخصية وغيرها من الجرائم الإلكترونية. في العام ٢٠٠٦، أنشأت قوى الأمن الداخلي مكتب الجريمة الإلكترونية وحقوق الملكية الفكرية بهدف مكافحة الجريمة الإلكترونية وتعزيز الأمن الإلكتروني في لبنان. غير أنّ هذا المكتب أثار كثيراً من الخلافات منذ تأسيسه، ولاسيّما بخصوص التعزيز الجائر لقانونٍ بالٍ من قانون العقوبات للعام ١٩٤٣، يجرّم التشهير بالموظّفين الحكوميين أو الرئيس أو العلم اللبناني أو الشعار الوطني. وفي حين أنّ حرّية التعبير وحرّية الصحافة مضمونتان في الدساتير اللبنانية "ضمن الحدود التي ينصّ عليها القانون"، فإنّ قانون العقوبات يُستخدم في أحيانٍ كثيرةٍ كمحاولة لإسكات الانتقادات عبر تجريم الأفراد حتّى لو اقتصر الأمر على النكات أو التعليقات الساخرة أو أيّ انتقاداتٍ للموظفين الحكوميين والشخصيات الدينية. وعلى الرغم من أنّ هذه الممارسة كانت شائعةً في السنوات المنصرمة، فإنّ احتجاز الأفراد بسبب التعبير عن آرائهم الشخصية على وسائل التواصل الاجتماعي يبدو أكثر تواتراً في الأشهر الأخيرة. وبالفعل، تمّ مسح ما لا يقلّ عن ٩ من مثل تلك الحوادث على مدى أربعة أشهر بين أيّار/ مايو وآب/ أغسطس ٢٠١٨. على سبيل المثال وبتاريخ ٢٠ تموز/ يوليو، احتجز مكتب الجرائم الإلكترونية الناشط الشاب شربل خوري بسبب كتابة منشورٍ بأسلوبٍ زُعم بأنّه ساخرٌ حول معجزات مار شربل. على أثر المنشور، تعرّض شربل خوري وجوي سليم ـ التي تفاعلت مع منشور خوري ـ لكمٍّ من الشتم والمضايقة والتحرّش والتهديد عبر الإنترنت. يطرح هذا الحادث بعينه تساؤلاتٍ كبيرةً حول دور المكتب واستعداده لحماية المواطنين بفعّاليةٍ من الجرائم الإلكترونية. ففي الواقع وبدلاً من ملاحقة المتحرّشين، احتجز مكتب الجرائم الإلكترونية واستجوب سليم وخوري لمدّة ساعات، ما يشير إلى أنّ المكتب يعمل كمؤسّسةٍ قمعيةٍ تعرقل التحدّث على الإنترنت أكثر ممّا يعمل كهيئةٍ أمنيةٍ تكافح الجرائم الإلكترونية. فضلاً عن ذلك، لم يُطلق سراح خوري إلّا بعد توقيع تعهّدٍ بعدم التعرّض للدين في كتاباته وبحذف حسابه على الفيسبوك لمدّة شهر. ليس لمثل هذه التعهّدات أيّ أساسٍ قانوني، لكنّ السلطات كثيراً ما تستخدمها كتكتيكٍ للتخويف بهدف منع الأفراد من القيام ببعض الأفعال. وبالفعل، ذكر كثيرٌ من المحتجزين أنّهم تعرّضوا أثناء استجوابهم للتهديد أو التهجّم عليهم أو منعهم من التواصل مع أيٍّ كان، بما في ذلك مع محامٍ. نتيجةً لذلك، يمكن أن يخضع الناشطون المحتجزون لضغط السلطات وأن ينتهي بهم الأمر بتوقيع تعهّداتٍ مقابل الإفراج عنهم، على الرغم من أنّ هذه الممارسات تمثّل انتهاكاً للمادّة ٤٧ من قانون أصول المحاكمات الجزائية اللبناني الذي يورد حقوق المحتجزين، ولاسيما الحق في الاحتفاظ بالصمت والتواصل مع أحد أفراد العائلة أو مع محامٍ. بصورةٍ عامّة، تشكّل هذه الممارسات والاحتجازات تهديداً لحرّية التعبير وتعكس التقلّص المتزايد لحيز حرّية التعبير في لبنان. ولهذا، فقد قام المجتمع المدني بتحرّكاتٍ نشطةٍ ضدّ انتهاك الحقّ في حرّية التعبير. وقد أُطلقت حملةٌ على الإنترنت "ضدّ القمع" على يد كثيرٍ من الناشطين والمنظّمات غير الحكومية بهدف شجب هذا "التراجع غير المسبوق في حرّية التعبير بكافّة أشكاله". فضلاً عن ذلك، فقد وضعت "دعوةٌ للتحرّك لشجب الاستدعاءات المتفشية التي تقوم بها السلطات اللبنانية تجاه الناشطين السلميين بما يتعدّى على حقّهم في حرّية التعبير" وحظيت بتوقيع كثيرٍ من منظّمات المجتمع المدني، وهدفت إلى زيادة الاهتمام بانتهاك الحقّ في حرّية التعبير في لبنان. كما نُظّمت مظاهرات، ولاسيّما بتاريخ ٢٤ تموز/ يوليو و٣١ آب/ أغسطس للاحتجاج على مثل هذه التوقيفات الاعتباطية. وقد ساهمت هذه الأحداث الأخيرة في توجيه النقاش حول حيز وحدود حرّية التعبير وكرّرت الحاجة إلى قانونٍ معدّلٍ يعرّف بوضوحٍ كلا الجانبين، وكذلك حول عدم استخدامه كوسيلةٍ للقمع في حين يضمن الأمن الإلكتروني في الوقت عينه. للحصول على وصف كامل للحدث ، انقر هنا.